Kathleen McMahon: With regret we announce the death of Kathleen McMahon, nee McQuaid, No 4, The Cottages, Glaslough. Kathleen passed away peacefully on Friday July 27th. in Cavan General Hospital, surrounded by her loving family. Her remains will repose at her residence this evening, Friday, from 5.00pm until 10.00pm and tomorrow, Saturday, from 12noon until 10.00pm. Her Requiem Mass will take place on Sunday at 10.00am in St. Mary's Church, Glennan, followed by burial in Drumbannagher cemetery. Kathleen was married to the late Jack McMahon. She was a lady of fun and loved socialising but she was a family woman first and foremost. She played her part in the Glaslough Community and was a great supporter of everything that was organised. She loved her Bingo and again it was more for the social end rather than what she might win but she used say to me - 'I can't win a penny at that ould Bingo' but it was seldom she was absent. She will be missed by so many but most of all by her family. To them we offer our sincere sympathies. Ar dheis Dé go raibh a h-anam naofa. Gerry Murphy: Mullan Road, Emyvale, Co. Monaghan, passed away on Thursday, June 21st, peacefully at Cavan General Hospital. His remains will repose at his residence on Friday from 3.00pm until 10.00pm. His funeral will take place on Saturday at 11.00am in St. Patrick's Church, Corracrin, followed by burial in adjoining cemetery. Family time please on Saturday morning. Gerry was a well known business man in the Emyvale area and beyond. Formerly owner of two major enterprises in the village and a founder member of Glenwood Furniture, Dunraymond, Gerry was regarded by all with whom he came in contact as a 'perfect gentleman'. He was quiet by nature and supported the local community in his own quiet way. He was predeceased by his wife, Susan, nee Treanor, and his son Kevin. His death will cause a void in his family circle and he will be sadly missed. To them we offer our sincere sympathies. Ar dheis Dé go raibh anam naofa. Sean Finn: It is with regret that we announce the death of Sean Finn, 7 Oriel Park, Emyvale, Co. Monaghan, which occurred in the early hours of Friday 15th, June, peacefully at his residence surrounded by his loving family. His Requiem Mass will be celebrated on Sunday morning, June 17th at 11.30am in St Patrick's Church, Corracrin, followed by burial in the adjoining cemetery. Family Flowers only please - donations in lieu, if desired, to The Irish Cancer Society c/o any family member or Peter McMahon, Funeral Director. House strictly private please. Sean was well known in GAA circles, having played for Truagh and Emyvale during his playing career. 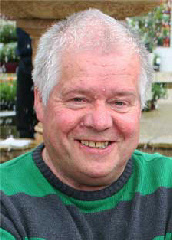 He was a terrific community person and had participated very positively in many local organisations. He was a member of the Board of Director in Emyvale District Credit Union for many years and helped to develop it through its formative years. He was also Chairman of Emyvale Community Council when the building of Emyvale Leisure Centre was in progress and his chairmanship coincided with one of the most stressful and difficult times for the Community Council but Sean steered the committee successfully through the problems and ensured the success of the project. He was involved in and supported many other organisations and through his example he passed on that generosity of spirit to his children who are now very involved in Community development and activity. May he now be enjoying the reward for his good deeds in the company of the saints in Heaven. Ar dheis Dé go raibh a anam naofa. To Dympna and his family we offer our sincere sympathies at this sad time. Rosie Connolly: No.2 Deravoy, Emyvale, Co Monaghan, passed away to her eternal reward on Friday, May 18th peacefully at her residence, surrounded by her loving family. Rosie's remains will repose at her residence until removal on Sunday to arrive at the Sacred Heart Church, Carrickroe for 12 noon Requiem Mass. Burial afterwards in adjoining cemetery. I heard just 24 hours ago that Rosie was very ill but I did not expect to get the news of her death so quickly. She was a great woman and I have known her all my life as, when I lived in Rarutra, our paths crossed regularly as she lived at Davagh Cross. She always had a great 'how-do-you-do' for everyone and a hearty laugh. I loved meeting her as her 'good spirits' was infectious. She was a hard worker and a fantastic supporter of all community events. Our communities are losing too many of such great people and we are all the poorer for it. May she rest in peace and enjoy the reward she has earned. Ar dheis Dé go raibh a h-anam. Kevin Magnone: 24 Oriel Park, Emyvale, Saturday,12th May, peacefully at St. Mary’s Hospital, Castleblayney, surrounded by his wife, Mai, and loving family and staff. His remains will repose at his residence on Sunday, May 13th. with removal to St. Patrick's Church, Corracrin for 11.00am Requiem Mass on Monday, followed by burial in adjoining cemetery. Family time please on Monday morning. Kevin joins so many other great sportsmen who have passed to their eternal rewards. He excelled on bicycle with the Emyvale Cycling Club, then known as St. Christopher's CC, and as a leading member of the Emyvale football club for over twenty years of loyal service to the Club. He was a 'very nippy' forward and one that gave many a defender the run-around taking points with left and right foot. He was a man of few words until he got into the company of his friends and then he could banter like the rest and give as good as he got. He was a loyal worker in Mullan Mills and a dedicated family man, all of whom will miss he dearly. To Mai and all the famliy we offer our sincere sympathies at this time. May Kevin rest in peace. Agnes Callery: The death has taken place of Agnes Callery, Cornacrieve, Emyvale, Co Monaghan, on Sunday, February 4th 2018 peacefully at her residence, surrounded by her loving family. Her remains will repose at her residence until removal on Monday evening at 6.30pm, to arrive at St Patrick’s Church, Corracrin for 7.00pm. Requiem Mass will be celebrated on Tuesday morning at 11.00am, followed by burial in the adjoining cemetery. Agnes, nee McAree, was a a quiet lady who was a regular attendee at the weekday morning Mass in The Oratory until very recently. Her husband, Charlie, was very much involved in the community and the members of their family have continued to contribute immensely to community life in North Monaghan. To all of them we offer our sincere sympathies. Ar dheis Dé go raibh a hanam naofa. Rose McBride: With sadness we report the death of Rose McBride, wife of the King of Country, Big Tom. 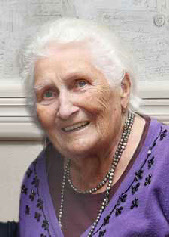 Rose(nee King), Oram, Castleblayney, passed away peacefully at her residence on Tuesday 30th of January. She was the loving mother of Thomas, Dermot, Aisling and Siobhan. She will be mourned by her Brothers and Sister, Grandchildren, Nieces, Nephews Relatives and Friends. Her remains will repose at her residence until removal on Thursday morning for Funeral Mass at 11.00am in St. Patrick’s Church, Oram, with burial afterwards in the adjoining cemetery. The House is Strictly Private at all times. Fr. Billy Hughes: The death has taken place of Fr. Billy Hughes in the Mater Private Hospital, Dublin. He has fought a great battle with illness in recent years and he passed to his eternal reward peacefully on Thursday, January 18th. There are no arrangements announced yet but we will bring them to you as soon as we get them. Fr. 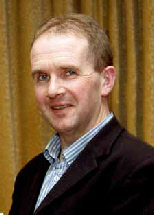 Billy was curate here in Donagh parish from 1986 until 2002. He was a very popular priest and had a great sensitivity for the sick and infirm. He adored his nephew Jamie and niece Aisling both of whom are well known by the people of Donagh. His homilies were listened to and his religious fervour and deep faith in God was very evident in everything he did. He was from Tullycorbett and his mother joined him in Emyvale for a while 'to look after him'. For me personally it is another friend gone to his rest. Billy and I were class mates in St. Macartan's and used visit each others homes during holiday time. He was a terrific footballer playing in defence and little passed him easily. During his priestly life he relaxed by fishing and playing the odd round of golf. We spent many hours together on lakes and rivers and he was always disappointed if he did not catch at least one fish. Then illness forced him to take life easier and we then met a couple of times while we both attended the Mater for treatment. He faced his illness with a great spirit of acceptance and courage but it won out in the end and his death came to release him from his suffering. I offer my sincere condolences to his sisters, Mary and Ann and to all his relations and friends. His colleagues, Bishop and fellow priests, have now to mourn the passing of another member of the team, a good friend and a good priest. To them we also offer our sympathies. Fr. Billy is predeceased by his parents and his brother, Seamus. Ar dheis Dé go raibh a anam naofa. Fr. Billy's remains will rest in the home of his sister-in-law, Rose, and people can call at the house from 12 noon tomorrow Saturday and from 10.30am Sunday until 2.00pm. His remains will be taken to Lough Egish Church at 4.00pm. Funeral Mass followed by burial in the family plot will take place on Monday at 12 noon. A Minibus service will be in operation from the Car Park atTullycorbett Community Hall to the house and people are asked to use this service. Trish Sheehan: With regret we announce the death of Trish Sheehan, nee Kelly, Main Street, Emyvale, which occurred peacefully at her residence on New Year's Eve 2017, just a short time before the turn of the year. Trish (Patricia)has been in failing health for a very short period of time but the end came more quickly than expected. Her death is another major event in the history of Emyvale as she and her family were so central to life there for decades and she and her family have handed on the mantel to the next generation. I have great memories of Trish as a young woman and she, Bridie Hughes, Nancy Hendry and Maureen McKenna calling with my mother and Annie Kelly to get a new dress made, adjusted or redesigned for the next dance in the Parochial or Swan Park. The fun and laughter still rings in my ears when I think of those days and the happiness that existed. Then one by one they moved away - Maureen to England, Bridie to USA and Trish was off as Mrs. Sean Sheehan to the beautiful island of Bermuda, where Sean was a policeman. When he retired they came 'back' and set up home on Main Street and very soon became very involved and supportive to local organisations. Sean became a well known figure and a man of great humour and friendliness and fitted into the community very easily and it was as if Trish had never been away. Since her return she has suffered the deaths of her sisters - Annie, Eileen and Kitty - and has been a regular caller with her brother, Mick, who lives a few doors away. Trish had a great love of her garden and her flowers and vegetables were well tended. She was very supportive of the Tidy Towns work and could be seen regularly cleaning up around her area and picking up rubbish dumped by some heedless person. She was a great neighbour and took a big interest in all that was happening in the area. Her interest extended to national and international problems and I had numerous conversations with her about some of them. Trish never lost the old ways of Emyvale where you looked out for others and had a chat for everyone - neighbourliness and friendship were her life rules and she applied them to the last. We offer our sincere sympathies to Aine and Cliona, her daughters; to Mick her brother and to the wide circle of relatives and friends. Her funeral Mass will take place in St. Patrick's Corracrin on Tuesday morning at 11am. Ar dheis Dé to raibh a h-anam naofa. 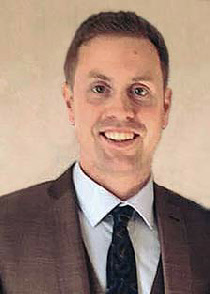 Sean McCaffrey: The announcement that Sean had passed away was a great shock to a very wide circle of people who knew and who had experience of even a short meeting with himduring his much too short a life. Son of the late Seamus McCaffrey and his mother Veronica, Sean was a sports fanatic and his life was dedicated to playing, coaching, developing, promoting and enjoying soccer from local to National and International level. The huge number of messages of sorrow, sadness, praise and acclaim that have been published indicate the enormous respect and admiration with which he was held by so many. However it was not just his ability, knowledge and enthusiasm that made him liked by the multitude but his very pleasant personality, friendship and genuine concern for other people that attracted him to others. Despite his own health problems over the years he made light of them when chatting to others who were battling their own problems and always showed concern and had a smile for everyone he met and yet he was very reserved and humble about his own ability and achievements. He will be sorely missed by his wife, his mother and his family and by a huge circle of friends and players with whom he worked during his career. His funeral will take place in St. Macartan's Cathedral, Monaghan, at 11.00am on Tuesday, January 2nd with interment afterwards in Latlurcan cemetery. May he rest in eternal peace. Our photo shows him in a situation he loved most. Fr. Tom Finnegan: For the second time in a month, the Diocese of Clogher has suffered the death of a much-respected priest. Fr Thomas (Tom) Finnegan, the Parish Priest of Magheracloone, County Monaghan, has died at St Francis’ Hospice, Blanchardstown, Dublin, following an illness which he bore with great courage and serenity. 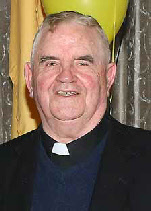 Fr Finnegan was a native of the parish of Killanny, on the Monaghan-Louth border, where he was born on 6 May 1942. He attended Ballymackney National School and afterwards pursued his education at St Macartan’s College, Monaghan (1957-62) and then at St Patrick’s College, Maynooth (1962-68). He was ordained to the priesthood on 19 June 1968. His first appointment was a Curate in Garrison, Co Fermanagh, where he served for five years. In 1973 he was transferred to Broomfield in the Parish of Donaghmoyne, County Monaghan. Five years later, in 1978, he was appointed Rector of St Patrick’s Agricultural College in Monaghan, a position he held for twenty-one years. In 1999 he was appointed Parish Priest of the south-Monaghan parish of Magheracloone and over the following eighteen years he ministered generously to the people there. 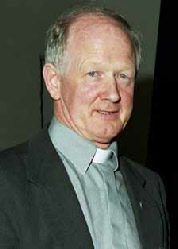 Fr Finnegan was a brother of Canon John Finnegan, retired Parish Priest of Cleenish, County Fermanagh. The priests and people of the diocese are saddened to learn of the death of Fr Tom Finnegan. While we were aware of his illness for some time, his sudden death has come as a shock to us. Despite his poor health, he continued to lead parish liturgies and provide pastoral care insofar as he could. Only earlier this month he attended the funeral in his native Killanny of the late Fr Joe McCluskey. Fr Tom came from a farming family and had a profound interest in agriculture and country life. His period as Rector of St Patrick’s Agricultural College was one of improvement amidst challenges and changes. He showed the same faithful dedication in his priestly ministry and his eighteen years of service to the people of Magheracloone offer a glowing witness to that. We extend our sincere sympathy to Fr Tom’s family and friends. May Christ, the eternal priest, whom Fr Tom served faithfully in this life, bring him now to the fullness of life in the kingdom of heaven and may the Lord support and console us all at this time. Arriving at St Patrick’s Church, Upper Magheracloone (Rock Chapel) on Sunday 31 December 2017 at 4pm for Prayers of Reception. Reposing from 4pm until 8pm. Arriving at Saints Peter and Paul Church, Lower Magheracloone (Drumgossat) on Monday 1 January 2018 at 4pm for Prayers of Reception. Reposing from 4pm until 8pm. Funeral Mass on Tuesday 2 January 2018 at 12 Noon in Saints Peter and Paul Church, Lower Magheracloone, followed by burial in the adjoining cemetery. Eternal Rest Grant Unto Him O Lord! Gabriel Bell: Shock, disbelief and utter sadness spread far and wide when the news of the death of Gabriel Bell began to circulate around Monaghan and further afield on Christmas Eve. Gabriel was one of the finest gentlemen you would meet and was very involved in community work, especially when it was to the benefit of the young people. I got to know him through his work for and involvement with the Emyvale Cycling Club over recent years. He was a great organiser and a powerful worker, devoting a lot of time to increasing the enjoyment for cyclists not only in the Emyvale Club but in all the surrounding clubs as well. His friendship, his encouraging words, his ability to see what needed to be done, his leadership qualities, and his enthusiasm influenced all around him and no one would refuse him. From all reports it is obvious that cyclists were not the only ones to benefit from his generous giving and organising talents. All of this has added to the feelings of great loss being experienced by so many but none more so than his family and close friends. To them we offer our sincere condolences. Reposing at his residence tomorrow (Wed) from twelve noon until seven o’clock. House strictly private at all other times please. Removal on Thursday at eleven o’clock, arriving to St Mary’s Church, Threemilehouse for funeral mass at twelve noon. Burial afterwards in the adjoining cemetery. Please note that there will be a shuttle bus in operation from threemilehouse end of Leck Road and a one way traffic system in operation.Ar dheis Dé go raibh a anam naofa. He will be sorely missed. Phine O'Neill: With sadness we announce the death of Phine O'Neill, nee Corrigan, Main Street, Emyvale, which occurred today, Saturday December 23rd in Cavan General Hospital. Predeceased by her husband, Kevin, and son, Stephen, she leaves behind three sons to mourn her passing - Patrick, Martin and Brendan. Phine's health has been failing for the past couple of months and she was surrounded by her family when the end came. Phine was daughter of the late Malachy Corrigan of Emy Mills and was always a quiet, reserved lady, who devoted herself to her boys when death took her husband after seven years of marriage. Living on Main Street she was part of a close knit community living at the bottom of the town and they all looked out for each other and supported each other through thick and thin. Phine was always ready to help when needed and was a great friend to all her neighbours. Living a couple of doors away I witnessed her generosity of spirit and the care she provided to neighbours. On Christmas Eve after midnight Mass in Corracrin my mother and I used go her her house and we all had ham sandwiches and tea. She was after cooking the ham for the Christmas dinner. We sat chatting and enjoying the food till all hours but it became a tradition and was carried on for years. She had a great faith which carried her through the loss of Kevin and Stephen and she lived her Christianity in everything she did. She was also a great musician and prior to the marriage she graced many a stage and entertained many an audience with her nimble fingers on a piano accordion. 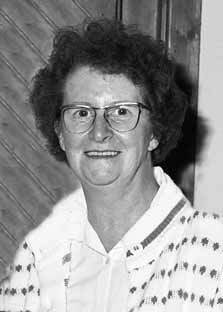 She and the late Veronica Treanor became regular musicians for the Senior Citizen parties and for the parties for those with Special Needs and Monaghan Arch Club. Again it was all done quietly and without fuss. I will always remember Phine as a wonderful person, a great friend and a huge loss to our community. To her sons ( Patrick, Brendan and Martin); to her daughters-in-law and grandchildren; to her brothers and sisters; to all her in-laws; to her nephews and nieces; and to all her relatives and wide circle of friends we offer our sincere condolences at her passing. Ar dheis Dé go raibh a h-anam naofa. Phine's remains will repose at Patrick's home at Moy on Sunday, 24th from 10am. Christmas Day will be family time until her removal to St. Patrick's, Corracrin, on Monday evening (Christmas Day) arriving at 7.00pm. Requiem Mass will be celebrated on Tuesday at 1.00pm followed by interment in the adjoining cemetery. Paddy (Tank) Murphy: It is very sad for me to have to record the death of Paddy (Tank) Murphy, Oriel Park, Emyvale, which occurred in Cavan General Hospital on Sunday afternoon, November 5th 2017. In recent weeks he has been having health problems but the suddenness of the decline since then has been totally unexpected and shocking. In the past few days it was obvious that he was slipping away and his family remained at his bedside and were there when he passed away on Sunday. Paddy was synonymous with Emyvale GAA as he gave such sterling service and loyalty to the club over a number of decades. He was first noticed as a quality footballer when he played with Knockatallon Minor football team and soon became a central player with Emyvale teams. Indeed it was a formidable team with himself and brother, the late Gay Murphy, playing on the field and their mother supporting from the sidelines. He never gave up his love of the GAA and his Emyvale club and he passed on that to his family. We offer our deepest sympathy to Frances and the family and to his brothers and their families and to the wider family circle. Our thoughts are also with his close and loyal friend and colleague - Packie (Speed) Hughes, who has been so close all the years and they attended so many games together until a few weeks ago. Ar dheis Dé go raibh a anam naofa. He will repose at his home in Oriel Park from 12noon until 10.oopm on Monday. His funeral Mass will be held in St. Mary's Church, Glennan, on Tuesday, November 7th at 11.00am. Mrs. Teresa Harvey RIP: While I was away last week Mrs. Teresa Harvey, Tully, Emyvale, passed to her eternal reward and I was unable to attend her funeral. I extend sincere sympathy to Seamus and Ann and to her relatives and many friends. Ar dheis Dé go raibh a h-anam naofa. Teresa became very involved in community as soon as she arrived in the area and throughout her life she contributed immensely to many organisations and developments in and around Emyvale. Seamus and herself were great supporters of Emyvale GAA and their support of the club, especially the juveniles and Corracrin school team, knew no bounds. During the years that Emyvale Leisure Centre was in the process of being built and established Teresa played a major role in the decision making and again led by example with her commitment and dedication, powered by a very positive attitude. It was a much deserved honour that she was elected as a Life President of the Emyvale Community Council, which was responsible for the project. Members of Emyvale Development Association would seek her advice when they were in discussion regarding a new project and they greatly valued her input to those discussions and her advice always proved correct. Her passing will evoke sadness in many hearts but most especially in the hearts of her loved ones, who will miss her most. Again to them we pass on our sympathy. Jimmy Magee RIP: We are saddened to hear of the death of Jimmy Magee RIP. Jimmy was a good friend to us here in Emyvale when we were running the big County wide Ultra Quiz, which raised a substantial amount for the building of the Leisure Centre and was a terrific community event. Jimmy came as Quizmaster for the final which was always held in the Scarna Inn to a packed house. He never wanted a penny for the job but always joined us for a meal before hand to hear about all that was going on in the sporting fields of Monaghan. At half time he took a very short break and then offered to answer any question from memory. There was a line up of people who thought they could catch him out but one episode in particular remains in my mind. A man in the audience had a 'great' question - 'who came third in the pole vault competition in the Olympics of ?'. Jimmy stayed quiet for a minute and the questioner thought - 'I have him'. Then Jimmy said very slowly - 'Don Bragg from USA was the winner but who was third, maybe Ronald Morris from the USA was second but third - eemm doubt you got me there unless I tell you that the third man jumped a height of 4.55 and was from Finland, now do you need his name?' The man with the question was still hopeful and said 'yes you have to give me his name'. Jimmy scratched his head and said -'you are really pushing me there and after a few moments of still silence in the Hall Jimmy said 'his name was Eeles Finstrom'. The man was blown away that Jimmy could remember such detail but Jimmy had the best laugh. The following year he asked me before the atart -'is your'e man here tonight?' I said yeah but he has no question tonight. Jimmy loved it. Our thoughts are with his family and we pray eternal life among the saints for Jimmy. Ar dheis Dé go raibh a anam naofa. Gary Askin: The North Monaghan area has been stunned once again by the death of a young person and another family is in deep mourning at the loss of a young family member. On Wednesday evening. September 13th. brothers, Gary and Stephen Askin, were at work along with all the other employees at Cornacreeve Mushrooms outside the village. They lived about 100 yards away along the Main Road and being beside home had many advantages, one being that they could run home for lunch and dinner. The details of the events leading to the tragic end of Gary's life and the injuries to other employees, including Gary's brother Stephen, on Wednesday evening around 8.00pm are unclear as yet and the Gardai and HSA personnel are investigating the timeline of what happened but it appears that some of them were working in the Wood Pellet Silo and Gary, who was very experienced in the work of the Mushroom Plant, went to the silo and, after helping Stephen and the others to exit the silo due to fumes, he himself was overcome and remained trapped in the silo. The call for help was raised and ambulances and units of the Monaghan Fire Brigade rushed to the scene. The paramedics began treating the others and some of them were then rushed to hospital while the Brigade personnel worked to gain sufficient access to the silo to release Gary but by then it was too late and he was pronounced dead at the scene. Many of the workers were present as were many of his close friends, who had heard of the accident. It was also a terrible time for his parents as they were on the scene as well. As the news spread throughout the community there was disbelief, shock and a deep sadness that this had happened to such a wonderful person and such a loving family. Gary was extremely well known in the community and had a huge circle of close friends. He was a member of the Emyvale GAA club with which he played for many years from juvenile to senior team and was joined by his other brothers Brendan and Stephen. He was also a member of the Glaslough Harriers and was a top class athlete winning many awards and showing a great commitment to the sport. He was a humorous young man with a quick wit and loved fun and had a pleasant, happy and joyful personality which attracted friends to his company. As an employee he was exemplary and highly thought of by his employer and he loved his work. His remains were removed to Navan Hospital for post mortem which was to be carried out on Friday morning. He will then repose at his home from 4.00pm on Friday until removal to St. Patrick's Church, Corracrin, on Sunday morning for 11.30am Mass with burial afterwards in the adjoining cemetery. Ar dheis Dé go raibh a anam naofa. To his father and mother, Eddie and Geraldine; to his sister, Laura; to his brothers Brendan and Stephen; to his girl-friend, Aoife; to his aunts and uncles and relatives; and to his wide circle of friends we offer our sincere sympathy. We also add our sympathy to his employer and colleagues at work as I am well aware of the devastation this accident has brought to their lives as well. We wish a speedy recovery to Stephen and the others who suffered as a result of the accident. Annamarie Colton: It is with a heavy heart that I report the death of Annamarie Colton, Lakeview, Emyvale, which occurred on Saturday, September 9th 2017. Annamarie has been in poor health for some time and knew what the future held for her. She faced her passing with unbelievable courage, fortitude and bravery. Those of us who had the honour of spending the time with her, especially the night of friends in the Hillgrove, will cherish the moments we spent in her presence. She was a terrific example to all. Despite and possibly because of her own battle with cancer, she was constantly enquiring about me during my treatment and called to the house when I came home leaving me a beautiful present which I will hold forever dear. She was a wonderful person and she had so many good friends who are all devastated at the news of her passing. However her death brings greatest sadness to her family: her children, Dwayne and Clodagh; her mother, Meena; her brothers, John Paul, Gerard and Mark; her aunts and uncles and cousins; to David; and to her wide circle of relatives. To them all we extend sincere sympathy at this very sad time. Annamarie's remains will repose at her home in Lakeview, Emyvale, tomorrow Sunday from 2.00pm until 10.00pm tomorrow night. Her funeral takes place at 11.00am in the Holy Family Church, Ballyoisin, on Monday with burial beside her father and two brothers in the adjoining cemetery after Mass.